As the Leica cameras got more sophisticated, engineers recognized that the light meter in the camera displayed a sensitivity to contrast. A frame looked the most contrasty when in focus, Richter said. This observation paved the way for autofocus technology. 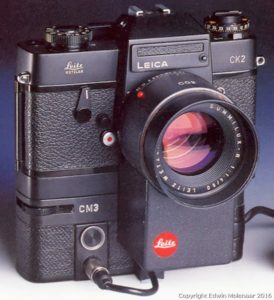 Leica used its Leicaflex SL2 for the autofocus prototype and equipped a 50 mm lens with a servo motor. Two LEDs on top of the viewfinder assisted in detecting the highest contrast of a subject. The motor turned the focusing ring, which freed the hand from taking part, Richter said. The camera was known as the Correfot. “It worked surprisingly well in low light,” Richter recalled of the prototype in his hands that day. “It wasn’t that fast because it took a number of gears for the motor to generate enough torque to turn the focusing ring, but at the time it didn’t bother me. We hadn’t seen anything like it. Leica sold the technology to Minolta, which marketed the first successful autofocus SLR with the Minolta Maxxum 7000. This was five years after Richter played with the Leica prototype. Leica passed on what it learned about auto focus to Minolta, which made the first commercially succesful auto focus camera in 1985 with the Minolta 7000. Leica passed its autofocus knowledge to Minolta, which made the first commercially successful autofocus camera in 1985 with the Maxxum 7000. Minolta further refined the motors, making them smaller and integrating them with the camera body. While the Polaroid OneStep SX-70 and the Konica C35 AF came before the 7000, Minolta gets credit for ushering in the autofocus era in 1985 when it released the camera with 11 lenses.